A graphic biography of civil rights leader and American icon Martin Luther King Jr. This graphical biography tells the story of the most prominent leader of the American civil rights movement. 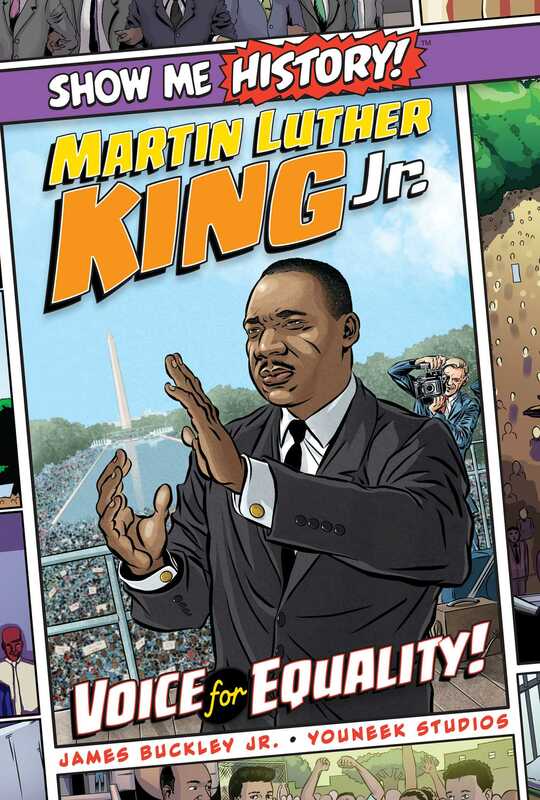 With full-color illustrations and a historically accurate narrative, Martin Luther King Jr.: Voice for Equality! will inform and entertain readers of all ages. From his childhood in Atlanta to his rise as an international icon of human rights and a fiery orator who refused to back down in the face of adversity, King’s life story serves as an ongoing source of inspiration. James Buckley Jr. is a prolific author of nonfiction for young readers, with more than 150 books to his credit (and still typing!). He is the author of more than a dozen titles in The New York Times' best-selling "Who Was...?" biography series, including the Wright Brothers, Milton Hershey, Betsy Ross, Jules Verne, and Blackbeard. Buckley has written more than thirty DK Readers on a wide variety of topics, plus two recent long-form bios of Adolf Hitler and Bonnie and Clyde for Aladdin Books. For Spring 2019, he created the first book in a new series for Aladdin—a bio of astronaut Michael Collins. Buckley is the co-author of Time Inc./Liberty Street's "X-Why-Z" series and wrote and produced the Animal Planet Animal Atlas for Liberty Street. A former editor at Sports Illustrated and the National Football League, he lives in Santa Barbara, California, where he runs a successful book producing company. YouNeek Studios is a hub for “YouNeek” and creative character-based storytelling and entertainment. Through the use of animation, comics, graphic novels, and other popular media, we aim to build a library of eclectic characters that appeal to a broad audience. Simply put, we focus on telling extraordinary stories about extraordinary characters. John Roshell is a co-founder of Comicraft, the lettering and design studio best known for pioneering the process of digitally lettering comic books. He has lettered thousands of comics for Marvel, DC, Dark Horse, Blizzard, and more; created hundreds of typefaces widely used in comics and video games; and designed loads of logos for franchises like the Avengers, Daredevil, Black Panther, and Angry Birds. He lives in Santa Barbara with his wife Starshine, two boys, and a somewhat ugly dog. Book Cover Image (jpg): Martin Luther King Jr.: Voice for Equality! More books from this author: James Buckley Jr.